Ohio will soon become one of 24 states that allows universities to decide whether concealed carry permits should be allowed on campus, a change that has brought about much discussion at Cedarville University. Gov. John Kasich signed Senate Bill 199 on Dec. 19 that lifts the ban on concealed firearms in “vulnerable areas,” namely on college campuses. The trustees of the institutions may now decide whether or not to allow concealed carry permits on their campus. The law takes effect on March 21. Several colleges have spoken out against the bill, including Ohio State, where allowing concealed carry is “not under consideration,” according to spokesman Chris Davey. The policy has not changed at Cedarville; concealed carry is not permitted on campus. Only the trustees can change the policy. University president Dr. Thomas White provided an official statement on the current status. The issue is certainly under discussion, however, as evidenced by chapel on Jan. 26, in which White asked five trustees their thoughts on the possibility of faculty, staff or students carrying concealed guns. Rev. Chip Bernhard, senior pastor of Spring Creek Church and chairman of the board, said the issue was going to be addressed at the trustee meeting in January, though he did not expect a final decision to be made soon. White highlighted the main reasons that students will likely not be permitted to carry: storage and safety issues in the dormitory and liability issues with insurance. Dr. Paige Patterson, president of Southwestern Baptist Theological Seminary and a Cedarville trustee, stated he requires his vice presidents, deans and at least three people in every building to carry at Southwestern in Fort Worth, Texas. Currently, only certain campus safety officers are allowed to carry on campus. It is an open carry and is not mandatory for all officers. To carry they must obtain certification from the Ohio Peace Officer Training Commission. According to Doug Chisholm, director of Campus Safety, officers must have “skills in the areas of human relations, crisis management, decision making and good judgment skills” in order to carry. Student officers are never permitted to carry. 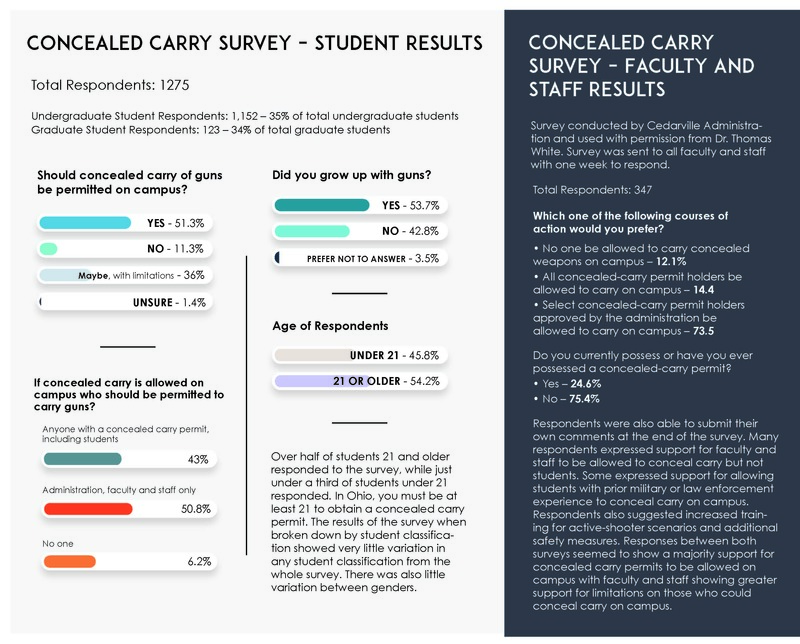 Cedars conducted a student-wide survey to see how students felt about the possibility of the concealed carry policy changing on campus. The administration also conducted a survey among faculty and staff to gather their opinions. The majority opinion of both surveys was in favor of concealed carry permits on campus in a limited capacity. Professor Jim Leightenheimer, associatse professor of communication arts at Cedarville, said concealed carry should be permitted for faculty and staff if the policy is correctly implemented. Eric Hinson, senior electrical engineering major, agrees that faculty and staff should be permitted to conceal carry on campus. However, he also believes students over 23 should be permitted to carry due to their age and maturity, and that there should be additional training and rigorous vetting for students with concealed carry permits. Rebecca Murch, freshman industrial and innovative design major, said she believes select students as well as faculty should be able to conceal carry on campus. Leightenheimer said additional restrictions, including a rigorous application process, additional screening and continuing qualification classes on a semester-by-semester basis should be implemented if concealed carry permits are allowed on campus. “So just to make sure that people are qualified and that they’re qualified and checked by people here, there should be a lot of accountability and ongoing training,” Leightenheimer said. Hinson disagrees with Leightenheimer and said there should be few additional requirements for faculty to carry beyond the permit. Murch believes the vetting process used to obtain a concealed carry permit is not sufficient for faculty and staff to carry on campus. Leightenheimer, Murch and Hinson said there is a need for concealed carry on campus at Cedarville. “I think it’s better to be prepared and not have to use it, than to wish something had been done prior,” Leightenheimer said. Both Leightenheimer and Murch referenced the attack at Ohio State University in November of 2016 as an example of the increase of terror attacks at universities. Murch expressed her concern that something similar could happen at Cedarville. Hinson believes that due to the lack of guns on campus, the response time for emergencies will be significantly delayed, especially during busy times of the day. “I feel that someone who has a bone to pick might target Cedarville especially because of our Christian stance,” he said. Not all faculty, staff and students see a need for or desire guns on campus though. Timothy Mattackal, junior finance and accounting major, said he believes concealed carry should not be permitted on campus under any circumstance due to the lack of need, as well as safety concerns. The trustees are still carefully weighing these concerns and will announce when a decision has been made. Alexandria Hentschel is a freshman international studies major and an off-campus news writer for Cedars. She enjoys old books, strong coffee and honest debate. No Replies to "Concealed Carry Raises Discussion"